Finally Found My Favorite Green Apple Soda! Green apple is by its very nature a tart flavor, which I fully understand; however, most green apple sodas on the market today are way too acidic and therefore too physically painful for me to actually drink. Despite many past disappointments, I valiantly forged ahead, trying each and every green apple soda that crossed my path, hoping to one day find a winner that I could actually enjoy. I wanted a green apple soda that was slightly tart, but not overwhelmingly so. 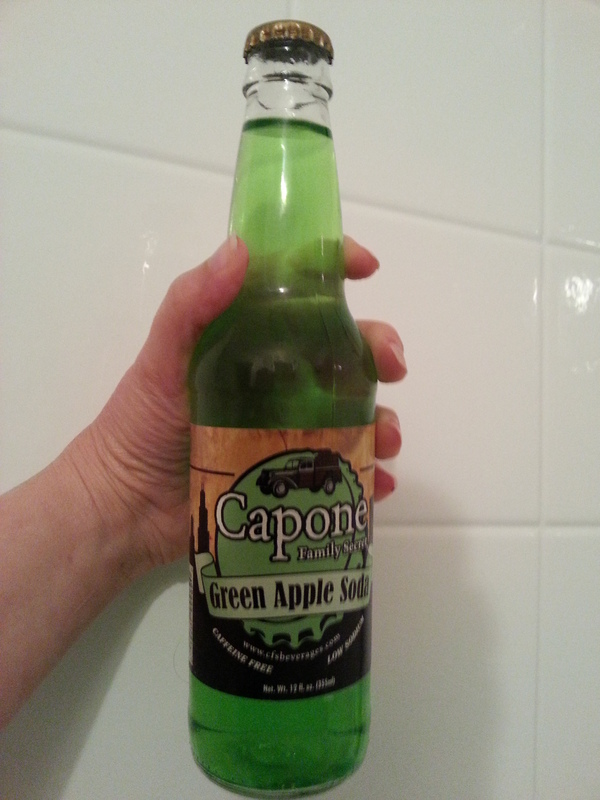 At long last I have found the green apple soda that seems specially crafted just for me; there is just enough of a sour kick, but not so much acidity that I feel like I’m eroding the skin off my esophagus: Capone Family Secret Green Apple Soda. Made in Illinois (of course! ), this green apple soda is refreshing and bright without any burning sensations. It’s sugary as all sodas are, but within reason. It’s the perfect balance of sweet and sour. Plus, who doesn’t love a product that evokes the gangster elan of Al Capone? It’s irresistible, really.